Yay! We just watched Kung Fu Panda 3 yesterday together with the children from Yayasan Chow Kit (YCK) at a fun day out with Po the Panda. See... Po was with us, seriously if you don’t believe go check it out. The ever friendly panda, Po obliged to stop and took pictures with his adoring fans. 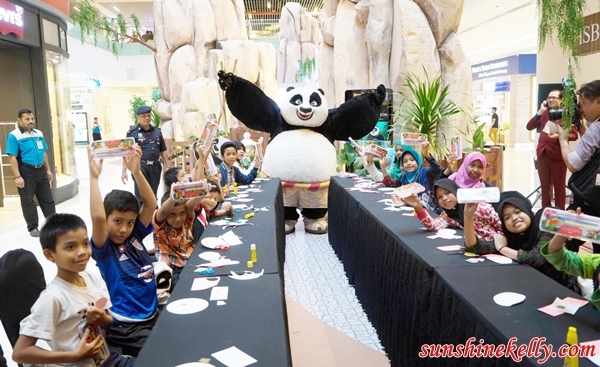 Giving every kid plenty of reasons to smile, laugh and create amazing memories, the fun-loving cartoon character even unveiled his signature Kung Fu pose to the kids. The 25 children from YCK, age ranging between 7 to 12 years old were treated to hone their artistic skills in Bao’s Arts and Craft workshop facilitated by The Parenthood, Malaysia 1st London Street Family Park, where they were taught how to assemble creative art pieces that literally pop up using special pieces of coloured material. After that they had more fun activities with Mei Mei at the Zumba Dance Class. Guess what? Out of sudden Po joined them because Po thinks that he should start exercise to lose some weight too. The fun is not over yet, the children were also treated to watch the movie, Kung Fu Panda 3 at TGV Cinemas and thoroughly enjoyed themselves with the action and comedy animation. The tall stone mountains inspired by the majestic Huang Shan mountain range in China, have emerged in the Main Atrium of Sunway Putra Mall, transporting you to the world of Kung Fu Panda from 4 to 20 March 2016. 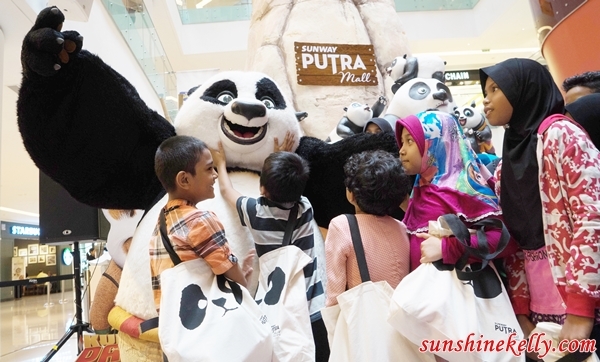 Pssst… you can meet Po as he will be making a special appearance at Sunway Putra Mall at 10.30am on 12 & 13 March. Get ready for a Paw-Some time in March there will be a myriad of fun activities lined up for the whole family every weekend from 4 to 20 March 2016. You will find a massive photo booth where you can take pictures with characters from the movie and print them out immediately as a souvenir. 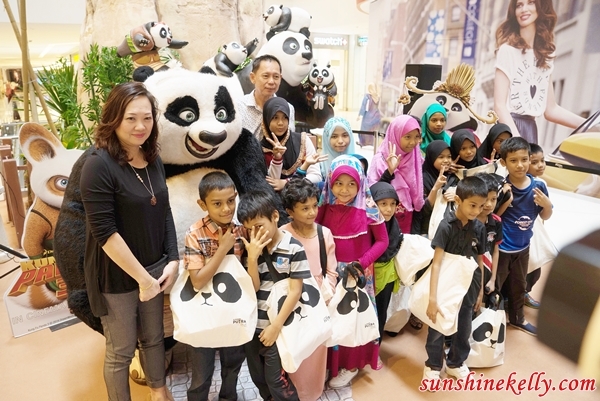 In collaboration with The Parenthood, the first London Street Family Park in Malaysia, Sunway Putra Mall will be having several activities for shoppers this school holiday. Come and learn the ancient Chinese martial arts just like Po in Master Shifu’s Kung Fu Workshop with The Parenthood, the first London Street Family Park. Learn the art of self-defense while practicing the art of self-control, concentration and discipline. It’s also a great way to keep fit. However, if you prefer to dance, you can also groove to the music in Mei Mei’s Zumba Class for a fun afternoon. It is a party like atmosphere where kids and adults alike can dance to the beat of Latin and modern tunes. Children can also express their creativity at Bao’s Arts and Craft Workshop where they will learn how to make cool paper craft creations like panda shaped masks and more. Even better, they can take their creations home after the class. As for food lovers who want a challenge and find out if they have what it takes to finish more than 2kg of Udon, a popular Japanese wheat noodle. Take part in Mr. Ping’s Ultimate Noodle Challenge where you will have to compete for a chance to be crowned the Noodle King and win the grand prize of 6 months’ worth of free meals at Marugame Udon worth up to RM6,800. If you are interested to participate in Mr Ping’s Ultimate Noodle Challenge can proceed to Concierge at Ground Floor or check out Sunway Putra Mall Facebook Page for more information. KFP fever everywhere!!! I am so eager to watch the movie. Your photos make me more excited. Kids really love Po! Well, who wouldn't right? Everyone seems so excited for Kung Fu Panda, it's crazy! Po is just adorable!!! I don't think my eldest has ever seen Kung Fu Panda ever. I'll get a copy of the movie. I'm sure he and his brother will enjoy it. Po is back! Been seeing him all over Kl recently, must be a big comeback after their last sequel. Haven't watch yet though.